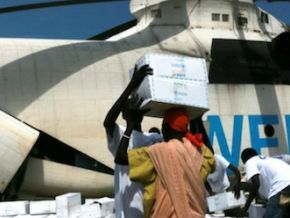 Thousands of people in South Sudan have received relief from a food security project which is addressing the nationâ€™s severe food and nutrition needs. To date, WFP has succeeded in procuring 8,500 MT of food, representing about 85 percent of the planned food procurement under this project. Food has been delivered to over 175,000 beneficiaries - more than half of the projectâ€™s overall target. â€œWFP, working closely with the Government, is doing a sterling job in delivering timely aid and allied assistance in the implementation of the STRERP project. We need to work even closer with community groups and leaders to maximize the coverage, impact and sustainability of the operations,â€￾ African Development Bankâ€™s Country Manager for South Sudan, Benedict Kanu said.